ASP.NET MVC Preview 4 is up on CodePlex. The Gu has all the exquisite Gu-Like Detail on his blog. Phil Haack has some notes on this release on his blog. If you take a look at the generated "changes" document, it shows a bunch of new stuff like AjaxHelpers and AjaxExtensions that set the stage for some interesting things the community could do with ASP.NET MVC and Ajax. I'd like to see some JQuery love in there, maybe with some MVCContrib as they've been quiet lately. Using the new Preview 4 bits, here's what I was able to get running in just a few minutes. Given a ViewPage that has a TextBox and a Button on it, when I click the button (and submit the form) I'll call back to the server and get some text that should then go in the div next to the button. Notice that the return method of the ExamineTextBox isn't an ActionResult, it's a string. In fact, the string result is being wrapped for you into a ContentResult. You could certainly make a ContentResult yourself, but this makes for a nicer looking method signature. This text is MVC different from before! And that UpdateTargetID (the span) mentioned in the Ajax Form helper above? That's swapped in via the magic in MicrosoftMvcAjax.debug.js. There are options for before, after and replace. Also, notice that the MicrosoftMvcAjax.js is new and it's in your /Content folder if you make a new MVC Application. Congrats to Phil and Eilon and the team for this release! anyway, i didn't mean to be negative. all this stuff is great. i hope there will be an article on using IronRuby with ASP.NET MVC Preview 4. there was supposed to be some support from it if I remember correctly. @Mike We're definitely looking into the idea of having more JQuery support one way or another. Several members of the ASP.NET team are fans of JQuery. I'll post some samples of using MVC Ajax w/ JQuery soon. Well, i have to say that I like jquery also. But don't ride off the implemantation of ms ajax only for winforms people who demand canned easy to use things. Fact of the matter is somtime a project roles around with the requirment that no opensource libraries be used. and that whatever it is being used is somthing to be garanteed supported by a Company like Microsoft. I've started a series of posts detailing the creation of a Grid html helper using AJAX and JQuery using the preview 3 bits here. I'd love some feedback/help. Although it works nice, I'd prefer an unobtrousive JS solution. I mean, I hate the standard ASP.NET AJAX framework for the bloat, the use of updatepanel and all that non-standard stuff, but at least it works in an unobtrousive way, so if the have JS disabled the page works in the normal way. I'll stick to my custom self-written ajax library for now, hoping to see something in the future. The MVC framework is awesome, been waitin for it for ages, and all you guys are doing wonders, keep it up! I noticed that when I refresh my page it doesn't loose value in textBox! What is it? View State come back? Why I ever need this? How can I disable?! I created some jQuery love for preview 3, and will also do this for preview 4 ofcourse... though it's too bad to see that p4 does not allow you to override the default ajaxhelper :( ... all methods are non-virtual. I'm missing HtmlHelpers such as SubmitButton, Image - were they removed? What's even better, is that it's optional and I don't have to use it. Unobtrusive is the way to go. NIrvana, I've been using the <a href="http://developer.yahoo.com/yui/>Yahoo! User Interface Library</a> with ASP.NET MVC without any problems, and I suspect you could easily do the same with JQuery. What I like best about ASP.NET MVC is that it provides me with a lot more control over my output than I ever felt like I had with ASP.NET WebForms. @Simone Nah, definitely not replicating UpdatePanel. UpdatePanel is a very different beast. It's focused on setting a region as "asynch updateable" and forget about it. There's a lot of magic involved to get it to work. It has to understand __VIEWSTATE, etc... This is very different from UpdatePanel. It's not fire and forget. You need to be explicit. You have full control. It's very lightweight. has page invoke page methods ? Could you do readme in PDF in the future? Thanks! Mike - There should be DOC and PDF versions of all the files on CodePlex. there's a bug in the ButtonsAndLinkExtensions class. Good find, Carl! I'll pass it on. looking forward to this release... I'm a fan of both JQuery and ExtJS. I just ran this sample, but how can you prevent your form from losing the text in the textbox after submit? It doesn't seem like the desired behavior in many ajax application. You'd have to put the text right back into the Textbox, I'm afraid! Is it too late to complain about the misuse of the 'using' keyword? Are we really freeing an unmanaged resource by calling Dispose on a Form object (or whatever object is returned by the call to Ajax.Form)? How about changing it to something where you're at least doing some sort of server side validation on the textbox input instead of something that could have been done without the postback to the server. I'm just saying it's a really confusing example... and it's hard to see what you're exactly getting with Ajax.Form. Guy - Valid point. I did it in like 2 minutes. Your example is a good one! I don't know why everyone is so into jQuery. Every prototype based library offers kind'a the same access elements. More to the point I like the idea of MooTools more than I do jQuery. And also I'll much more like to use ASP MVC Ajax rather than jQuery. It is a matter of personal preferences after all. I for one have never used ASP.NET before mostly because I didn't find it appealing enough. Ever since MVC was introduced things changed and I hope it will be ready for release soon =p~. Congrats to the MVC Team you are building a great piece of software. What adjustments do you have to make at the IIS in order to publish the .net website using MVC framework? Tania - For IIS7, nothing, it just works. For IIS6, you need to associate the MVC extension with the ASPNET_ISAPI dll. I finished up some jQuery love. @GuyIncognito: I like the "using" syntax. It think it's far more readable than a lot of Begin() / End() blocks (it won't compile in case of errors, whereas it would just spit out invalid HTML otherwise). So, .net MVC not even a beta yet. Do you have a timeline for the releases? I would like to know it because we are planning to use it for a very important project of ours. Thanks! Tania - I think MVC will be released in a month than ends in "-ber." Hi Scott. Thank you for your responses. 1) Where are you keeping the state - server? Saw the runat="server" controls on your examples. What happens when one page depends on the input values from other pages? I am used to keeping it in the Model as Value Objects. 2) How does the 'session' come into play in this? You guys are doing great work with MVC and the Ajax helpers. One question though: why are the helpers sealed? That could be a great extensibility point for other JS frameworks. Thanks for the simple post; sometimes the 2 minute ones are the best ;). How about a new insertionmode for the Ajax helper to write to the outerHTML instead of the innerHtml therefore replacing the target completely. I've tried with FF and all works fine. I've tried with IE 7 and the HTML was messy after the async callback because of the way the result was rendered (the footer goes away). So September it is! Ah, just kidding, but not really. From personal experience, the only issue I'm having with this current setup is that the receiving action can no longer view the Request object for the value of the submitting button. in the action, I cannot view the value of my submit button. I tested with the hidden input, and that worked great, but on a form that has several buttons, you need to be able to pull out the value, or have a different way of distinguishing which of the buttons was pressed. Hey Scott, any way to avoid this and have this app behave like an Ajax app should? I need the form data to remain in the form after the asynch form submission. 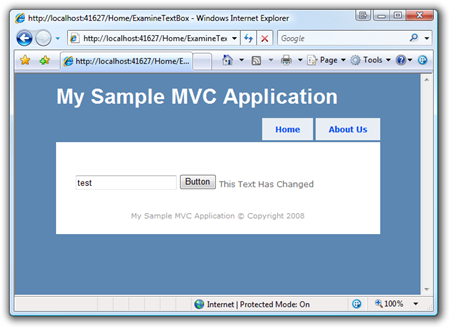 There´s a nice sample about ASP.NET MVC and Ajax Forms on http://sharpmasters.blogspot.com/. Wow. MVC looks a lot like ruby on rails.